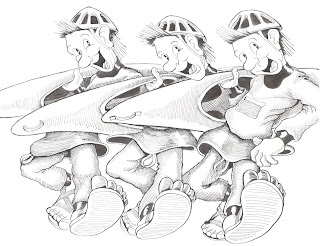 This is a graphic I made for a t-shirt for one of the many Riverhouse Rendezvous slalom races I ran in the 90's. I think this was for the third series. Anyway, I really like this one because it is sooooo happy!! The goal here was to make the three "amigos" be in perfect synch with each other, like a dance step. Take the aspects of dance steps; precision, rhythm, grace, and balance, and apply them to whitewater, and you get something very close to kayak slalom racing.